Trained in both New York and Paris, Charles Courtney Curran was a prolific artist known for his idyllic paintings of young women. 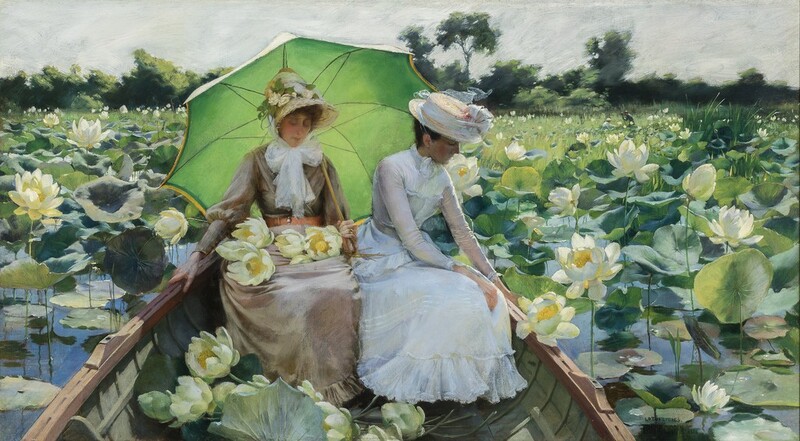 In Lotus Lilies, two women—Curran’s new bride, Grace Winthrop Wickham, on the left, and her cousin Charlotte “Lottie” Adams Taylor, on the right—sit in a row-boat surrounded by lilies carpeting the surface of a lake. The women are protected from the glare of the summer sun by hats, diaphanous veils, and a large green parasol. The painting’s foreshortened perspective positions the viewer in the boat. Although Lotus Lilies predates Curran’s first trip to France in 1889, it demonstrates his awareness of the emerging aesthetic of impressionism. Like many Americans experimenting in the new mode, he tempered bold color and free brushwork with refined academic drawing. Shortly after Curran created this fond portrayal of his wife, the couple moved to Paris, where the painting won a medal in the Salon of 1890.